Liverpool are unbeaten in 33 Premier League games, and almost 21 months, at Anfield, and Jurgen Klopp‘s side need support, not anxiety to keep that going. According to a search on Google—which will have tracked my clicks and soon be offering me pop-up ads for psychiatrists—the main causes of anxiety are work, finances, relationships, illness, drugs and death. By May, I fully expect ‘following Liverpool FC in a title race’ to be on that list. They’re really going to put us through it, aren’t they? 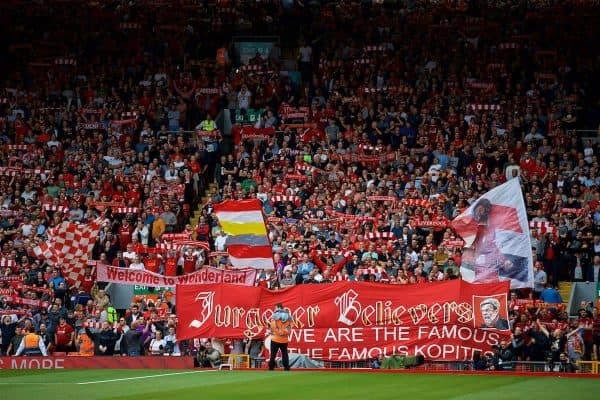 You’d experience less ups and downs during a weekend at Alton Towers than supporting the Reds over the next three-and-a-half months, and if Anfield on Wednesday night was anything to go by it’ll have sucked the living soul out of most of us before the race is run. I didn’t enjoy Liverpool vs. Leicester. Not at all. Watching football in conditions cold enough to make an Eskimo’s eyeballs freeze or a Geordie lass wear a light jacket isn’t particularly fun, especially when the Reds don’t play well, but it was the general Anfield angst that made it a thoroughly unenjoyable evening. Even at 1-0 up in the opening 15 minutes the grumbles, moans and groans at even the slightest error by any Liverpool player were beginning to build. 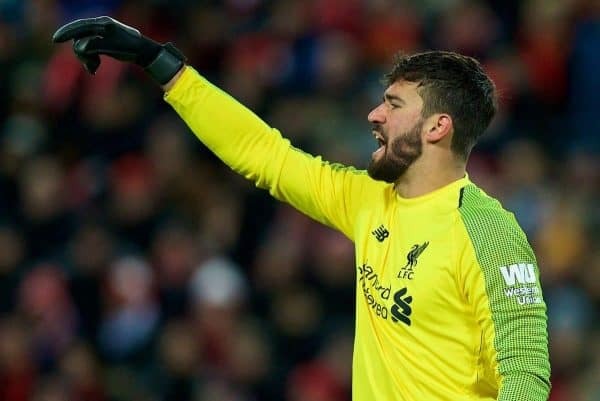 The fact that the pitch was hugely difficult for both teams to play on was largely ignored with howls of derision getting louder and louder at every misplaced pass, mis-controlled ball or lackadaisical clearance by Alisson, who seems to think he’s in The Matrix when playing against Leicester and has all the time in the world. There were even a smattering of boos at half-time, borne out of pure frustration, but you know things are fraught when even a Kopite who didn’t return a ball that ended up in the stand quickly enough was whistled and jeered as the Anfield anxiety took a firmer grip than The Mountain had on Prince Oberyn’s skull in Game of Thrones. Such stress levels are perfectly understandable. They’re inevitable when you want something as badly as we all want to see Liverpool win the league, but on a matchday they’re counter-productive. We saw it against Chelsea in 2014, when Brendan Rodgers’ Reds stopped playing their normal game at 1-0 down and panicked amidst an anxious atmosphere, and there’s a danger of it happening again. Angst in the stands transmits to both sets of players on the pitch. On Wednesday it created additional, unnecessary pressure for those in red and told those in blue they were doing a good job. Howling for everything didn’t exactly influence referee Martin Atkinson either, who did us no favours. Harry Maguire tugged Sadio Mane so hard that he went down like Gemma Collins on ice instead of racing clean through to potentially make it 2-0, but Slabhead only saw yellow and rubbed rocksalt into the slush by equalising shortly afterwards. Then there was Ricardo’s heel-clipping, balance-toppling foul on Naby Keita which was such a blatant penalty that Atkinson needs a trip to Specsavers rather than VAR to help him out. So much for Penaltypool. All those things combined together, coming on the back of Man City‘s loss at Newcastle (and singing Rafa Benitez’s name after 90 minutes if the Reds had won instead of after 10 minutes before we didn’t win might have been a better idea), turned Anfield into a nervy, anxious, fretting cauldron, which doesn’t bode well for the seven remaining home games. Anfield has been Liverpool’s biggest asset this season. 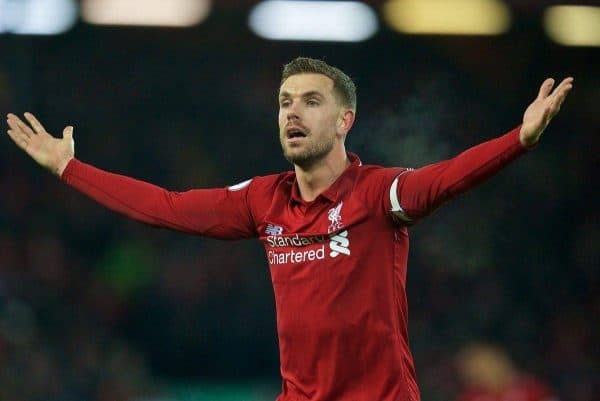 The Reds are unbeaten at home since 2017 in the league, only Man City had left with a point this season before Wednesday and we’d barely conceded a goal there. Perhaps Crystal Palace scoring three at Anfield a few weeks back has undermined confidence in our home form a little, or maybe it’s just early title fever. Either way, it can’t be allowed to turn into prolonged audible angst against Bournemouth, Watford, Burnley, Spurs, Chelsea, Huddersfield and Wolves. If it does, Liverpool will not win all of those games. I’m old enough to have seen Liverpool win the last three of our 18 league titles. 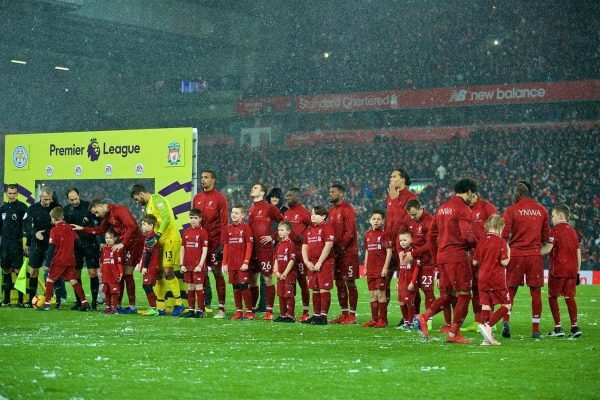 I’ve also seen us not win the 28 played for since and experienced plenty of fraught, uneasy Anfield nights during that time, but I can’t remember our crowd being so tense, so agitated, so skittish for a league game in January before. Far be it from me to preach to the converted, but if the energy wasted in creating such Anfield anxiety can be channeled into singing and chanting instead I’m convinced Liverpool’s 1-1 draw with Leicester will be no more than a blip. If it can’t? Home games will become a lot more difficult. Chris McLoughlin writes for This Is Anfield each Friday; he’s also senior writer for the Official LFC Matchday Programme and LFC Magazine. You can order copies of both here.